Introduction: Aspiration may contribute to non-alloimmune lung allograft injury and eventual graft loss. Medical and surgical interventions have been advocated including fundoplication, but there is no current consensus about when this should be carried out. Biomarker approaches, including measuring pepsin1 and bile salts2 have been proposed to document aspiration and may potentially inform treatment, but there are few longitudinal studies. Hypothesis: Pepsin is present in serial bronchoalveolar lavage (BAL) samples from lung allograft recipients. High levels early post-lung transplant may be a practicable guide/rationale for early therapeutic intervention. Methods: Ten lung allograft recipients without bronchiolitis obliterans syndrome (three male, median age 43 years, range 20–61, two with an episode of clinical infection, one aspergillus and one pneumococcus) underwent longitudinal bronchoscopy and standardised BAL with transbronchial biopsy to assess rejection. BAL samples taken at one week, one month, 3 months, 6 months and a year were analysed for pepsin using an ELISA specific for pepsin. Results: Pepsin was detectable in variable amounts in all patients including high levels early posttransplantation. The figure plots this, and broken lines highlight three patients with early elevated levels. These three patients also had clinically significant (A2) acute vascular rejection, concordant with elevated pepsin, but no evidence of clinical infection. There was a trend towards higher pepsin levels (mean ± SEM) in patients with early A2 or greater rejection 26.7 ng/ml (±8.2), compared with patients with lesser grades of rejection 14.9 ng/ml (±3.3), p = NS. Conclusions: Aspiration may be an ongoing injury to lung allografts. High levels of pepsin, detectable in some individuals early posttransplantation suggest a need to consider early treatment interventions. This is supported by other clinical work in progress within our group. Our observation of concordant high pepsin levels with clinically significant acute rejection implies that aspiration may significantly contribute to an injury pattern previously attributed solely to alloimmune injury.
. Am J Trans 2006;6:1930–8 . Introduction: Gastric aspiration has been shown to occur in lung transplant recipients and is often asymptomatic. Aspiration has been associated with bronchiolitis obliterans syndrome and anti-reflux surgery has been shown to be beneficial in this patient population. The indications and optimal timing of surgery and the best method to quantify reflux presaging aspiration are poorly defined. Methods: Lung transplant recipients were recruited prospectively between November 2007 and July 2008. Within the first 3 months posttransplantation, patients were asked to complete a reflux symptom index (RSI) questionnaire for symptoms of extra-oesophageal reflux and were asked to undergo objective assessment for reflux (manometry and pH/impedance; MMS Omega System). Testing was performed while subjects were on maintenance proton pump inhibitor therapy. To assess current surgical practice we canvassed six major international lung transplant units using a structured, standardised enquiry. Results: 12 lung transplant recipients were recruited with a median age of 46 years (range 24–59). Studies were performed at a median of 22 days posttransplant (range 17–90 days). 6/12 patients were positive on RSI questionnaire. 6/12 had abnormal oesophageal peristalsis and 10/12 had reflux. One patient exclusively had non-acid reflux. Median acid exposure time for all patients was 28% (range 2–80%). There was little correlation between symptoms and reflux. 5/10 with reflux had a positive RSI score. Overall, their median score was 12 (range 4–32), half of patients without reflux had a positive RSI score (range 6–21). There was a negative correlation between symptoms and acid exposure time (Pearson correlation −0.449, p = 0.143). Responses from lung transplant units were varied from aggressive early intervention to a “wait and watch” approach and there is currently no agreed consensus between lung transplant units on criteria for the management of reflux aspiration. Conclusion: There is a high prevalence of reflux in lung transplant recipients in the immediate postoperative period. There is no consensus over the best time to assess or operate on patients for reflux/aspiration. Addressing this may impact positively on allograft outcomes and should be actively considered by the transplant community. Both heart and lung transplantation are established treatments for advanced cardiopulmonary disease. Transplant recipients require lifelong immunosuppression to prevent allograft rejection placing them at risk of opportunistic infections. The reported incidence of invasive aspergillosis in transplant recipients is 5–20%. Treatment with amphotericin resulted in patient survival rates of less than 40%. We report a single centre experience of treating fungal infections with the newer antifungal agents. We studied 108 patients at our hospital from September 2005 to December 2007 who required inpatient treatment of fungal infections, they were identified from pharmacy records. Diagnosis required clinically compatible illness, the fungus was identified in bronchoalveolar lavage specimens, blood, biopsy by microscopy, culture, or radiological evidence of compatible pulmonary lesions after excluding other aetiologies. Outcomes are reported as either successful (complete response: resolution in clinical signs and symptoms with regression of radiological lesions; partial response: clinical improvement with marked improvement in radiological lesions; stable: clinical improvement without marked improvement in radiological lesions) or unsuccessful when patients did not survive to hospital discharge. 108 patients (61 male) were treated, 86 lung and 22 heart transplants (annual incidence 29.7% and 3.2%, respectively). Age at time of treatment was 46 years (range 19–65). Time posttransplant was 4.5 years (range 2 days to 13 years). 54 patients were taking tacrolimus, 21 ciclosporin and 11 sirolimus. 43 were treated with voriconazole, 33 caspofungin and 31 were treated with both voriconazole and caspofungin. One was also treated with a third agent (liposomal amphotericin). Duration of treatment was 1.5–11.5 weeks. The interaction between voriconazole and calcineurin inhibitors led to peak calcineurin inhibitor levels on day 3 of treatment. 87 were successfully treated, 70 lung (81%) and 17 heart (77%). 21 were unsuccessful. In lung transplant recipients, most infections occurred either early (during the first year; 30) or late after 5 years (36). Common symptoms in lung transplant recipients were fever (22), dyspnoea (35), cough (25), purulent sputum (12) and fall in FEV1 (14). We found lower mortality from fungal infections treated with voriconazole and caspofungin than reported after amphoteracin treatment. Our data support a strategy of early, aggressive treatment based on standard criteria. Introduction: The purpose of this study was to determine the incidence and types of malignancies occuring post-lung transplantation and their impact on survival compared with transplanted patients without malignancy. Methods: A retrospective analysis of the local transplantation database for all heart–lung, single-lung and double-lung transplants between 1988 and June 2008. Data were collected on baseline demographics and survival from transplantation. In those diagnosed with malignancy, type of malignancy, interval to diagnosis, survival from diagnosis and survival from transplantation was recorded. Results: A total of 735 transplants (Tx) was performed, which included 186 single lung (SLTx), 230 double lung (DLTx) and 319 heart lung (HLTx) transplants. 403 were male (55%) and 332 female (45%). There were 43 recorded malignancies (6% of all transplants) with 28 men (65%) and 15 women (35%). 15 of these patients remain alive. The mean age at diagnosis was 54 years (men) and 43 years (women). Types of malignancy included posttransplant lymphoproliferative disorders (PTLD) 17 (40% of all malignancies), skin 18 (42%), lung two (5%), gastrointestinal four (9%), prostate one (2%), unknown one (2%). Mean interval from transplant to diagnosis/diagnosis to death/transplant to death (months) as follows: PTLD 16/45/60, skin 52/47/95, lung 74/1/76, others 64/16/86. Mean survival posttransplant without malignancy was 49 months. Compared with the other malignancies, PTLD was diagnosed in a younger age group (mean 40 years; range 13–61). There was no significant difference in survival between SLTx, DLTx and HLTx patients in “malignancy” versus “no-malignancy” groups. However, those with malignancy and SLTx fared worse after diagnosis compared with DLTx and HLTx (mean survival 16, 62 and 67 months, respectively). Conclusion: In this cohort, PTLD and cutaneous malignancies accounted for 82% of all malignant diagnoses. There was no difference in overall survival posttransplantation between the “malignancy” and “no malignancy” groups but those with lung and gastrointestinal cancer had the worst prognosis after diagnosis of malignancy. Interestingly, the diagnosis of PTLD or skin cancer did not appear to affect long-term survival, with survival curves approximating the “no malignancy” group 10 years posttransplant. Abstract S21 Figure Survival post lung transplant—with and without malignancy. Introduction: Surgical lung volume reduction has, in general, poor success rates for patients with advanced emphysema and alpha 1 antitrypsin deficiency, when compared with patient groups with replete alpha-1-antitrypsin deficiency. This is demonstrated by a short duration of beneficial effects and higher mortality rates. However, these patients are often at a younger age and additional treatment strategies to the medical treatment would be desirable. 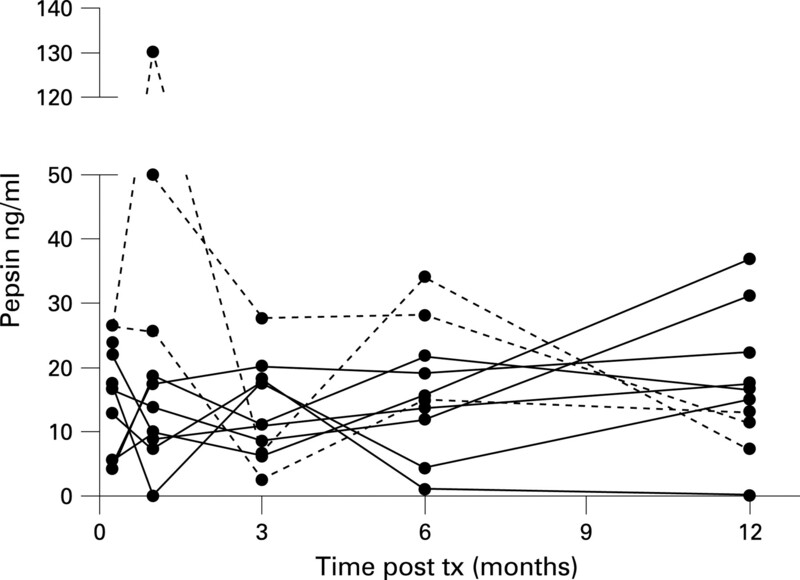 Methods: Four male patients with alpha-1-antitrypsin deficiency and advanced heterogenous emphysema with severe hyperinflation, referred for transplantation, were treated with endobronchial valve insertion after optimising medical therapy. The target lobe or segments were identified by computed tomography scan (in two patients middle lobe; one patient lingua; one patient baso-apical segment of left lower lobe). The endobronchial valve insertion was performed during an ordinary bronchoscopy procedure with minimal sedation. Baseline clinical data were gathered and the response to intervention was measured. Results: For the entire group baseline forced expiratory volume in 1 s was 710 ml (21.1% predicted), residual volume–total lung capacity ratio (RV%/TLC) measured by body box: 74.5% and the 6-minutes walking distance: 264 m. After the treatment three patients experienced a clinically significant improvement of their lung function and walking distance whereas one patient had an unchanged follow-up. The average increase of the FEV1 was 225 ml (range 10–500 ml), RV%/TLC declined to 64% (range −0.2 to +32%) and the walking distanced improved on average 92 m (range −30 m to +475 m). The average observation time was approximately half a year. Interestingly, no patient had pulmonary infection in the valved part of the lungs and infective exacerbations were not more frequently observed. One patient coughed up his valve. Conclusion: Endobronchial valve treatment was a feasible treatment strategy in our patients with advanced emphysema due to alpha-1-antitrypsin deficiency and was not complicated by increased pulmonary infections. Background: Postoperative pulmonary complications (PPC) result in increased morbidity and mortality after lung resection. Pulmonary risk factors such as predicted lung function have been studied extensively. The contribution of non-pulmonary factors is less clear. Our aim was to define possible risk factors for PPC at a large regional thoracic surgical unit. Methods: A prospective observational study was performed on all patients following lung resection via thoracotomy in a regional thoracic centre over 9 months. The following measures were recorded: chest radiographs showing consolidation or atelectasis, elevated white cell count >11.2 or administration of antibiotics postoperatively, temperature above 38°C, positive sputum microbiology, production of purulent sputum, oxygen saturations <90% on room air, diagnosis of pneumonia/chest infection by physician or readmission or prolonged stay to the ITU/HDU with respiratory problems. Scoring positive for four or more measures was considered indicative of postoperative respiratory infection/clinically significant atelectasis. Results: 155 subjects were observed. Mean (SD) age was 61 years (15), 91 men (60%). Surgical procedures included 19 pneumonectomies, 77 lobectomies, nine segmentectomies, 43 wedge resections, four exploratory thoracotomies and three sleeve resections: 20 subjects met four or more criteria (13%) and all had clinical evidence of PPC as assessed by the physician. These subjects had a mean (SD) age of 65 years (12) of which 15 (75%) were men. Higher body mass index (BMI; 26 ± 4 vs 29 ± 4), preoperative activity level less than 400 m (20% vs 47%), ASA score above 3 (51% vs 84%) and percentage predicted FEV1 (84% ± 20% vs 71% ± 18%) were all significantly (p<0.05) associated with PPC on univariate analysis. The PPC patient group also demonstrated a significantly longer hospital length of stay (LOS; 6 ± 3 vs 14 ± 6 days) and high dependency unit LOS (1.0 ± 0.0 vs 1.4 ± 0.5 days). Conclusion: High BMI, ASA score, lower preoperative activity level and predicted FEV1 are all significant risk factors for the development of PPC following major lung surgery. Preoperative modification may alter these risks and targeted therapy in these high-risk groups may reduce the morbidity and mortality of PPC.